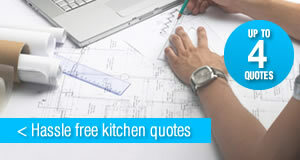 Getting a quote for your new kitchen could not be easier. Are you looking for a new kitchen? Simply fill out one form and let kitchen suppliers contact you with prices and quotes, don't waste hours of your time browsing websites or crawling the high street when you can get fast quotes from up to 4 suppliers. *This is not a valid name. *Your Name is required. *This is not a valid email address. *Your Email is required. *This is not a valid phone number. *Your Phone Number is required. *This is not a valid post code. *Your Post Code is required. Please tell us any additional information such as kitchen style, units required (if known), room size etc. 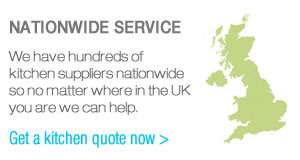 Fill out one quick form and get quotes from up to 4 kitchen suppliers. No need to spend hours getting quotes when they can come to you. Make sure you get the best deal on your kitchen by comparing up to 4 quotes from our listed suppliers and partners. As any professional will tell you, comparing quotes from multiple suppliers can save you huge amounts of money and ensures you get the best value for money.